The golden age of cinema is re-created at this Disney park and it’s laid out like the streets of Hollywood were in the 1930s. There a mixture of shows, thrill rides and experiences here and they’re all based around movies you’ll know. The big landmark in the park is the Tower of Terror, a recreation of a classic Hollywood hotel featured in the Twilight Zone. As always with Disney, it’s so much more than just a ride. The hotel lobby feels like it’s stood still in time for decades and the staff are all dressed as Bellboys. The ride is essential an elevator car that zooms up and falls down the tower. If you have your eyes open at the top when the doors open you’ll get a great view! Elsewhere in the park, the Toy Story shooting ride is superb and you’ll feel like you’re part of a video game. 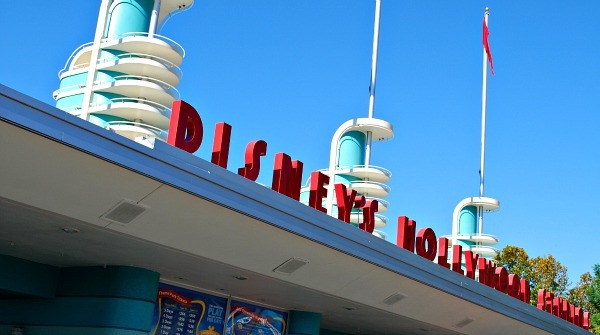 It’s not unusual to find lines of 2 hours for this ride, so make use of the free FastPasses. There are two stunt shows and they’re both well worth seeing. One is based on Indiana Jones and the other is all about car stunts. The whole family will enjoy the Beauty and the Beast stage show and for thrill seekers, the Rock ‘n’ Rollercoaster, which zooms around in the dark, is great fun. All in all, we had a great day out at Disney’s Hollywood Studios, but we wouldn’t recommend staying for the evening show. We felt it was a bit of a let down and mainly consisted of images projected onto waterfalls until the Disney characters turn up at the end. 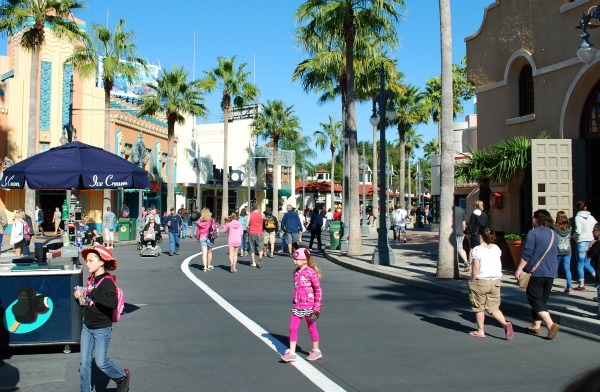 Both the Tower of Terror and the Rock’n’Roller coaster (pictured below) are in the same part of the park, so if you like your thrill rides, call in here first to see what the lines are like. Both of these rides have a FastPass option which is a way to skip the line at a later time of the day. 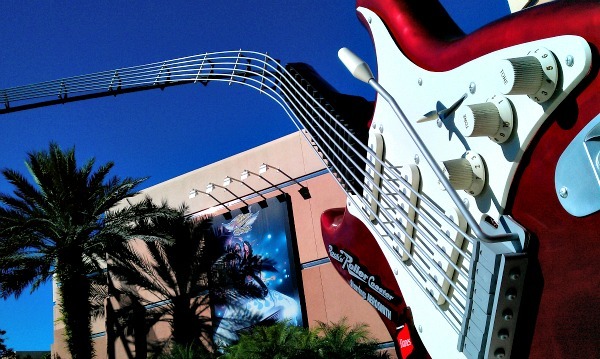 The Rock’n’Roller Coaster is themed around the band Aerosmith and is laid out as though you’re in their recording studio. The roller coaster ride is supposed to simulate a VIP limousine arranged for you by the band to skip the down-town traffic and it’s great fun! If you’re a fan of Star Wars, the other must see attraction here is Star Tours which has been revamped in recent years and is a much better experience now it’s in 3D. The premise is that you are taken on a passenger space flight by mistake with the driod C3PO driving…badly. Along the way, you’ll see much of the Stars Wars universe. There are also more Star Wars features under construction. For something more sedate, take the Great Movie Ride which moves slowly through re-created famous movie scenes from over the years – the whole family enjoyed this one. Also right at the back of the park is the Backlot Tour which takes you through some of the production areas at the park. 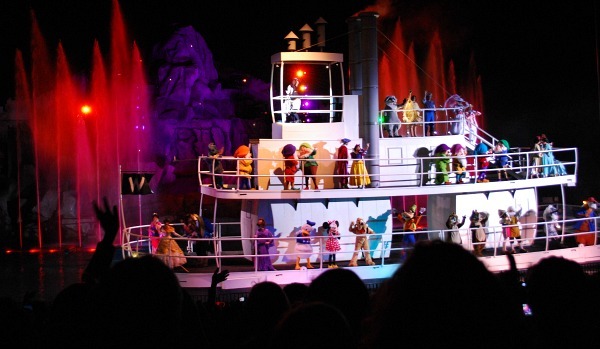 The night-time show mentioned above is called ‘Fantasmic’ and it’s the one thing in the park that didn’t come up to the standard of everything else. Without doubt, the highlight is the large boat that appears right at the end jam-packed with the Disney characters (see below) but the contrived story to get to this bit is drawn out and downright boring in places. Having said that, if it’s a warm night and you have no-where else to go, you will probably enjoy it.